Credit for this ring's design has to go to one who wishes to remain nameless. It is a beautiful design made all the more appealing (I think) because (OK, I admit it) I filed away rather more metal than maybe I should have. But, what might have been a disaster ended up being really lovely and delicate. The way that it has been filed means that it tapers away from the three points to leave a triangular shape. 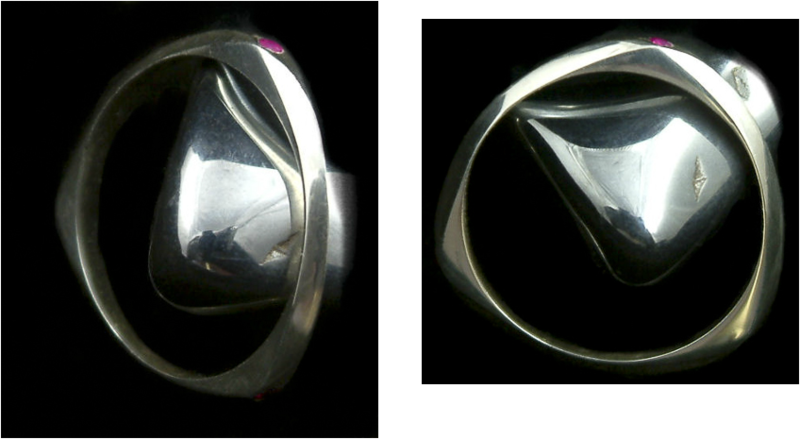 Also, what began as a square profile is now triangular, too: there is a knife-edge running round the edge of the ring. Each of the 3 points is set with a small pink ruby.